During the 2009 swine flu pandemic, which of these college events did not lead to a sharp increase in flu cases on their respective campuses? July 4th social at the Air Force Academy. Two swine flu vaccine clinics at Bates. Trick question, really. All four events led to an uptick in flu cases at their respective colleges— even the vaccine clinics at Bates. 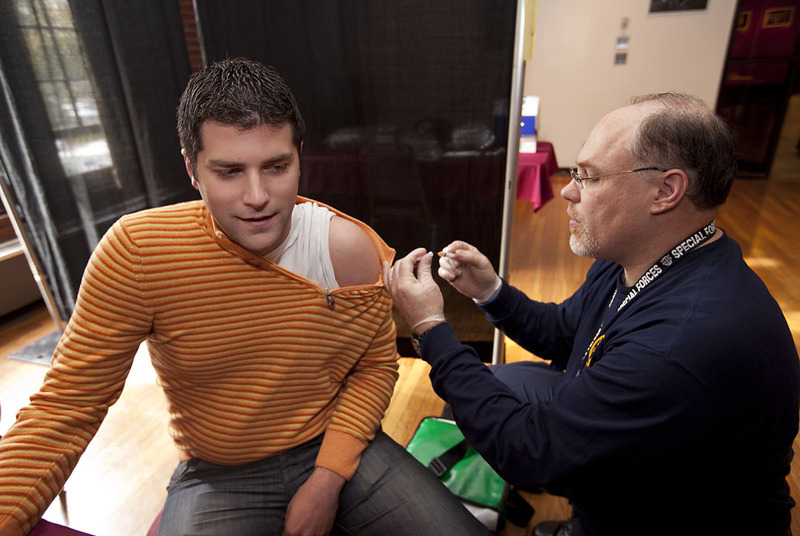 During a vaccine clinic in October 2009, Miljan Zecevic ’10 receives his vaccine injection. Photograph by Phyllis Graber Jensen/Bates College. This curious fact, that a vaccine clinic could be linked to a surge in flu cases, is explained in a recent scholarly article, “The Effect of Mixing Events on the Dynamics of pH1N1 Outbreaks at Small Residential Colleges,” by Bates epidemiologist Karen Palin and mathematician Meredith Greer in the Journal of American College Health. Of the many U.S. colleges that saw outbreaks of swine flu cases in the summer and fall of 2009, Palin and Greer looked at Bates, Bowdoin, Colorado College and the Air Force Academy because of their similar size and their residential, undergraduate structure. Instead, suggest Palin and Greer, the role of the clinics in the spread of H1N1 at Bates in 2009 has to do with how those clinics influenced events outside Chase Hall, specifically student traffic patterns. To investigate the spread of H1N1 during the Bates outbreak, the researchers used a standard mathematical model that categorizes all community members as either susceptible to the disease, infected or recovered (hence the model’s acronym, SIR). The SIR model assumes a small community that is “well-blended.” At a place like Bates, “well-blended” means members live in close proximity and encounter each other in classrooms, residence halls, the library, club activities, athletics facilities, arts venues and, of course, in Commons. “The SIR model did not match the reality we observed,” Greer says. “Bates is about as well-blended as any modern-day community,” says Greer, associate professor of mathematics. 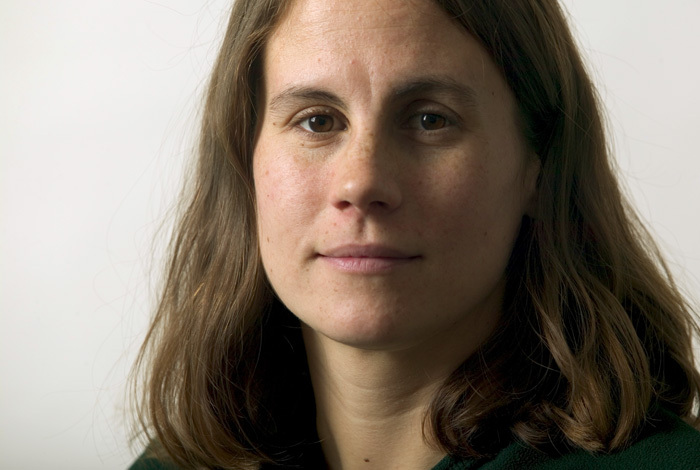 Mathematician Meredith Greer found that the standard model for tracking the outbreak of disease didn’t work for the Bates H1N1 outbreak of 2009. Photograph by Phyllis Graber Jensen/Bates College. Based on the initial Bates data, the SIR model suggested a slow, steady increase in flu cases. But what happened at Bates was “in stark contrast” to the model’s predictions. Three days after each flu clinic (a common incubation time for H1N1), the number of cases at Bates spiked. Indeed, “the SIR model did not match the reality we observed,” Greer says. But why? It wasn’t that students got infected at the clinic; a variety of established protocols made that very unlikely. Instead, the researchers believe that the clinics created subtle changes in student traffic patterns on campus. Students took different routes to get from point A to point B, thus coming into contact not with more students on those days, but with different students. Hosting a clinic may have “facilitat[ed] the spread of pH1N1 in unexpected and unknown ways,” the authors say. Let’s say that on Oct. 15, 2009, student “Sarah” altered her routine by including the Chase Lounge vaccine clinic on her usual Parker-to-Pettengill afternoon route. In doing so, she came into contact with different students than usual, giving a hug to one she hadn’t seen in awhile and who, unbeknownst to her, was infectious. It doesn’t stop there. If Sarah changed her routine, then maybe her roommate “Jessica” also changed hers, even if she didn’t plan to attend the clinic. And so on. All of this means that “the concept of ‘well-blended’ is more complicated than originally thought,” Greer says. Take Commons. At Bates, all students dine under one roof, blended together like stir-fry. A germophobe’s nightmare, right? 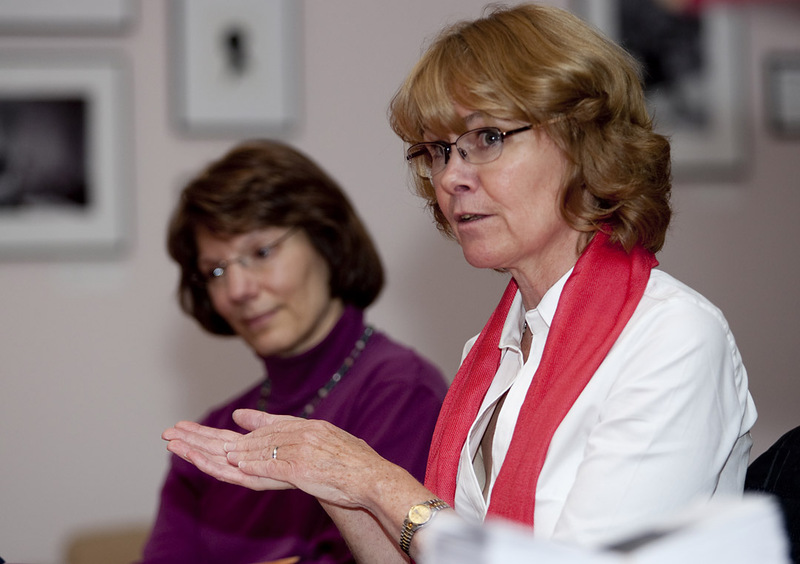 Karen Palin, an epidemiologist and lecturer in biology at Bates, discusses the H1N1 outbreak at Bates in October 2009. With her is is Associate Professor of Biology Lee Abrahamsen. Photograph by Phyllis Graber Jensen/Bates College. Second, they found that students tend to sit with the same friends each meal, reducing the blending and lowering the likelihood that Commons was a major reason for the spread of H1N1. “Again, this led us to the idea that changing social patterns [due to the clinics] could really be the culprit in spreading H1N1 in 2009,” Greer says. Instead, their results are more observational, intended to identify “when a vaccine clinic apparently functions as a mixing event” that disrupts normal student traffic patterns, hastening the spread of an infection. And if you still want advice for the current or any flu epidemic? “Get vaccinated, wash your hands, and cover your mouth if you cough or sneeze,” says Palin.